Having a healthy home is important to us parents because we want our kids to play on clean and safe surfaces along with making sure we are all breathing clean air. 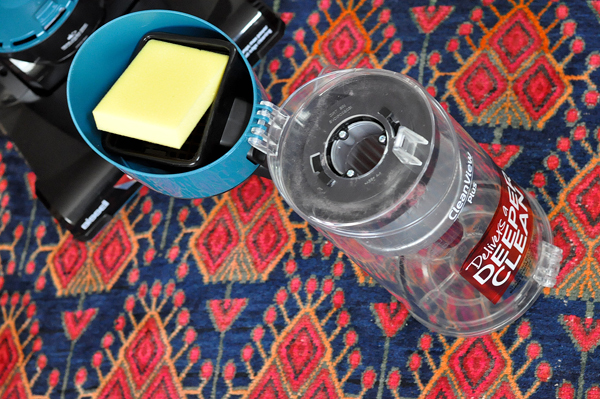 We were sent a new BISSELL® CleanView® Vacuum with OnePass Technology™ vacuum to check out. We have 4 rooms and a hallway with carpet, so its important to us to have a quality vacuum that really works. We are the type of family that removes our shoes before we walk about in our home, but no matter what having an active family always bring in dirt. Living in Oregon, it is also important to clean carpets often to pick up dander and dust to prevent it for being whisked up into the air resulting in allergies for some people. Plus dirt and dust can float in from outside through vents, screens, open doors, etc and it all settles eventually on the ground. The BISSEL CleanView has a built in premium HEPA filter, to clean the air being sucked and pushed around. We were curious to see how this BISSELL vacuum would work. BISSELL has been known for a quality reputation and the Cleanview Vacuum is a very affordable vacuum that has really good suction. We put it to the test and were very happy with the results. We own a high quality vacuum with cyclone technology, and the results were very similar. How I base a good result, is by the dust, dirt, pollen, dander, and whatever else ball along with the rest of the dirt that is picked up in one cleaning. After one cleaning there was a good sized ball of dirt and debris, which shows that this vacuum works. And there is height adjustment for thick carpets to bare floors, which are also important to keep clean of dust and dirt. The canister is easy to remove and empty, pull it out and drop the bottom. It also includes a reusable foam filter, that is simple to clean. I dont think people realize how dirty carpet gets. We have light colored carpet so its important we clean every few days, and a quality vacuum likes the BISSEL ClearView with that high suction technology really gave us the results we need to see. We also have stairs which pick up a lot of dirt since they are near the front door and the BISSEL ClearView includes attachments for further reach and tighter squeezes, but the best tool of all is the turbo brush. This hand held attachment hooks to the hose and uses air to power a brush which is good for picking up hair, dirt, etc. This worked out nice on the couch since we have a small terrier who sheds a little. To purchase look at major retailers like Macy’s or www.bissell.com. Also be sure to stay connected by LIKING BISSELL on Facebook or FOLLOWING BISSELL on Twitter. ]This review is in partnership with the Mom It Forward Blogging Network. We have a Bissell for cleaning our carpets and upholstery and it is wonderful. Especially for the couch, chair, etc. Our furniture is a light sand color and will show any mark quickly so it works great for that. Bissell is a great brand.. I have a sweeper that I practically use every day! Wow this looks like a good vacuum. I have a Bissell Rug Steamer and I love it! I am just waiting for my vacuum to die so I can replace it with a Bissell. They may cost a little more but they are worth every penny.